England goalkeeper Paul Robinson has criticised the unpredictable nature of the new World Cup match ball. The Tottenham stopper, 26, has been practising with the lighter ball in England training ahead of Saturday's Group B opener against Paraguay. And he warns the balls will give strikers the upper hand in Germany as they are "very goalkeeper unfriendly". Robinson said: "It's more like a water-polo or volleyball. It's very light and moves so much in the air." 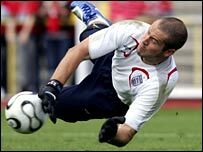 England's first-choice keeper revealed, however, that he became familiar with the new ball long before he arrived in Baden-Baden with Sven-Goran Eriksson's squad this week. "I had the foresight that the ball wasn't going to be what we're used to, so with four or five weeks to go I got my agent to get me half a dozen of them," Robinson said. "I mixed them in with the training balls at Spurs, and for the last five weeks of the season I've been training with them. "It's something we have to deal with. They're bringing out new balls all the time." "When the ball gets wet it's even worse. It's as if the new ball has a plastic casing around it. "It doesn't even have to be a shot from Ronaldinho or Roberto Carlos; the ball will be moving about all over the place." Despite the wildly variable flight of the ball, Robinson insists he will not do anything differently. "I don't think you can because if you start doing things you don't normally do during the game that's when things can go wrong," he said. The former Leeds goalkeeper is determined to ensure he is as well prepared as possible before England open their campaign on Saturday and admitted: "I'm my own biggest critic. "Every goal that goes in, even if it's one from 25 yards that everybody says you could do nothing about, you wonder if you could have got a stop in. "If I'd have done this, or that; is there any way I could have affected the outcome of it? "But playing on Saturday will be a very, very proud moment for me as a footballer and as a person. "Every time you pull on an England shirt it fills you with a lot of pride. "I've been given the chance to be one of the few English goalkeepers who have played at the World Cup finals and I'm really looking forward to it."